hotel, the Key Largo Grande Resort & Beach Club. It has great views of the Florida Bay and its famous sunsets. Of coarse, this property offers amazing watersports for everyone to enjoy Watercrafts, Sailing, Parasailing, and Eco-Tours. The watersports is run by Caribbean Watersports which offers one my top tours in Florida of the Back Bay and the Everglades. 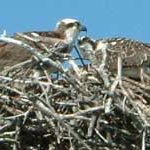 If you are like most Americans, when you think of the Everglades and Everglades National Park, you think of alligators looking for prey and airboats skimming across the Florida sawgrass. You may also visualize some swampy area in South-central Florida where humans rarely visit, the wildlife still rules and survival of the fittest was still in order. What if I was to tell you that the Everglades was full of Dolphins, Fire Sponges and Sea Horses? Would you believe it? It is True! Everglades National Park not only covers the swampy lands of South-Central Florida, but also extends down into the crystal clear, blue water paradise of the Florida Keys. 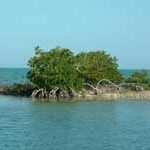 This is where you will spot dolphins and seahorses living in harmony among the mangroves trees and hidden islands of the Keys and Florida Bay. Salt water and fresh water combine to create an incredible habitat for water dwellers of all kinds. The best part is that you can experience it all on the Caribbean Watersports, Enviro-Tour of the Everglades and Florida Bay. We left the docks of the Key Largo Grande Resort & Beach Club on an 18- foot inflatable powerboat and headed into the Florida Bay. As we raced towards the mangroves, Captain Duane informed us of some interesting facts about the Key Largo waters. We were told how many of the islands off the coast of Key Largo were man-made. Many of them were developed when builders blasted dynamite to create a path for industry ships. This path is now known as the Intercoastal Waterway. The Intercoastal is approximately 8 feet deep; the rest of the Florida Bay averages three to four feet in depth. As the sand moved, the islands formed. mangrove islands propagate themselves by dropping long seed pods into the water which, in turn, float away until they collect on nearby sandy or muddy shoal areas and grow into other mangrove islands. 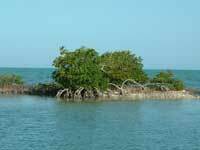 The mangrove trees are the only trees know to be able to grow out of salt water. The tree actually has the ability to separate the salt from the water. The mangrove does this through a sacrificial yellow leaf that collects the salt from the salt water and sends the newly unsalted water to the rest of the tree. This sacrificial leaf is then released from the tree for a new one to grow, collect salt and also be sacrificed. From this point, the trees grow and spread across the low levels of water to create a home for birds and water creatures of all kinds. 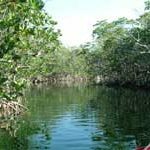 Along the trim of the mangroves and in the crystal clear waters live dolphins, manatees, seahorses, sponges and various fish. 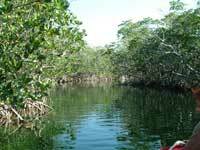 We toured along the edge of the mangrove tree islands and through the naturally created mangrove tunnels. All the while observing the beauty of the Everglades and it’s inhabitants in their natural environment. Dolphins were swimming along side the boat as we searched for manatee in the shallow waters. 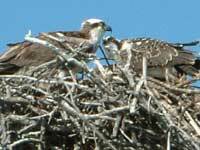 We stopped by the mangrove islands to observe the Osprey making nests on the top of the channel markers. We scooped some sand to see the seahorses swimming throughout the clear waters. It was amazing to be a part of nature while being careful not to interrupt. About two hours later we were back at the dock. Back to the developed land that overlooks the peaceful everglades. Captain Duane informed us of a great local restaurant, called Mrs. Macs, where we could go to get a taste of the Keys. We finished off a beautiful morning, learning about the Everglades beyond the swamps, with a fantastic lunch. Everglades National Park is a unique place to visit. The crystal clear, blue waters of the Florida Keys provide the perfect atmosphere to spot Dolphins and Manatees among the Mangrove trees of Florida Bay. The rare combination of salt water and fresh water create a special habitat. You can experience it all on the Caribbean Watersports, Enviro-Tour of the Everglades and Florida Bay.